Let’s give Nokia a big warm welcome as they make their hopefully triumphant return to the United States with their very first Windows Phone 7.5 device in the Nokia Lumia 710, now available from T-Mobile.com and T-Mobile stores nationwide. Arriving in both black and white for $49.99 after a $50 mail-in rebate with a two year contract, we think the pricing for the Lumia is fair, despite the few reservations I had about the phone during my review. As this phone is geared more toward a first-time smartphone buyer, my reservations would hardly prevent me from recommending the Lumia 710 as a solid entry-level smartphone. Then again, I’m just super excited to see Nokia finally return to the United States handset market and look forward to seeing what else they have in store. I would love to see the nokia n8, or even the n9 on tmobile! Windows mobile just doesnt do it for me. It actually feels pretty good in your hand, weight is nice. The back is a nice surface won’t slip out of your hand like the Sensation might. I haven’t had a chance to fool around with Windows Mobile but I’d be willing to give it a shot. Just FYI “Windows Mobile” not exist for more than 1 year now! I don’t know you are just trolling or you simply doesn’t have knowledge but the new platfrom and os from Microsoft is “Windows Phone” which is a brand new and it is fresh start and nothing to do with old “Windows Mobile”. btw I will also continue to refer to the latest symbian release as symbian belle instead of nokia belle as is the new moniker. Cheers to TMO for being the Nok’s first US WP but Jeers for them picking up such a run in the mill device. Good job!!! I hope Nokia will give discounts to Nokia legacy owners!!! or may be a trade-in program for Nokia owners!!!! I might get this as my second phone coz I do not have 3G on my Iphone 4s with Tmobile! I wonder when Nokia is going to put out the Morph. That will be the sweetest phone. I’m glad Nokia’s back. I would love to hear experiences with this phone . My astound isn’t astounding me anymore . I do love Nokia . Symbian not so much . Anyhow I might consider buying this phone in month or so . I like the windows platform . I will either pick up this or the Radar . Which ever I can get for under two hundred on the bay . Baffled as to why TMO wouldn’t pick up the 800 . I would so game that . Put a non tmo firmware on the astound or even Belle and be…..astounded! I’m doing some reading up on that : ) Really is a nice phone for the 150 I paid on ebay last summer . Will buy another phone soon though . Look below ya : ) I’m in the same boat . From what I heard the Nokia exclusive apps like Nokia Drive and ESPN give the Nokia a slight advantage . However the display and camera on the HTC radar are supposed to be a wee bit better . Blynman, I tried calling and chatting, and I have to wait until then, they were like unless you want it that bad. Na chill. Commander_Fury, it’s such a Dilemma right. All 3 phones I’ve had have been Nokia, and knowing that they are durable and the fact that the lumia will have NokiaDrive is what I like. For the HTC radar, the FFC, the elegance of the phone, and the spectacular reviews by Tmobile customers on the website. Chill’s cool . I like Nokia mucho as well . The thing about the HTC also is the Nokia has some micro sim thing . So I guess you can’t just swap sims out . I’m an EM+ guy . You can’t chain this down : ) Anyhow after more toy around with this a winner will show . And ofcourse maybe my hope of a TMO Lumia 800 will show itself . That is such a major fail on Nokia’s/TMO’s part . 2g on TMO and AT&T with the 900 Lumia . The Lumia 800 is really hung out to dry in this country . 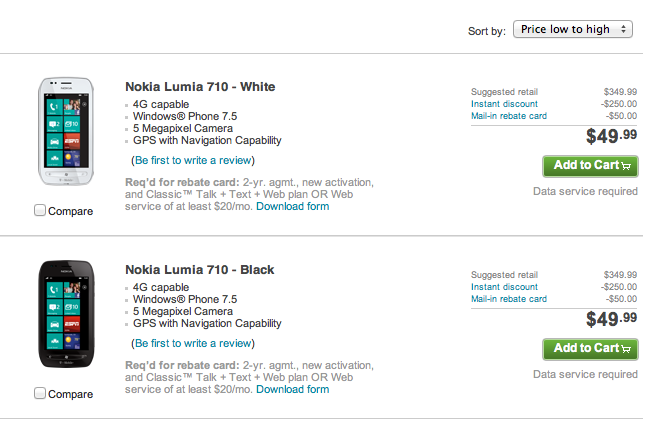 Even a Canadian carrier is picking up the Lumia 800 . Can’t speak to the 710, but I’ve been using the Radar for the past month, and it is truly a great phone. I bought it off contract planning to upgrade to one of the Nokia’s when they came out. Now, doubt I’m going to be upgrading for quite a while. I have a feeling that either way you go will be win-win. It’s a good problem to have. That’s nuts! I say screw them,go to Target and get HTC Sen for free,for upgrades and new customers! not sure how long this deal will with Target! That where I got my SG2 for $99. in Dec! Some one above wrote that u can get it free at Costco’s or at wmdeals.com under current promos. Hope’s this helps. If you really want this phone that bad,go to tm store in person if you can see what they tell you. Nokia has a better hardware!!!! Am sure you can pick it up today,since your contract is up in 5 days. I would call them and see what they say to you. HTC Radar is better than Lumia 710. If It was Lumia 900 then yes Nokia for sure but in this case go with HTC Radar 4G. A solid phone, beautiful and very well built quality. It’s smooth and crazy fast as well not that Lumia 710 is not but for look and feel go with Radar 4G. What are basing this on? Device just launched an you are already an expert?? DOUBTFUL! HTC Radar for the win. Sorry Nokia. But we still love you and the Lumia 900! Radar doesnt win anything. Its settling for the next best thing because Tmo doesn’t offer anything better. Not excited by the Radar or the 710. I’ll just hang on to my HD7 until my contract is up then it’s off to AT&T for the Titan II or Lumia 900. Sadly same here with me. T-Mobile really made me disappointed with not offering any high-end Windows Phone devices. as will many people .. i’ve had a Titan (sold it recently) and it is THE best Windows Phone out right now .. haven’t had a chance to play with a Lumia 900 but still .. TMO is lacking in the WP department .. lacking big time. Definately want to see the Titan II close up. That camera looks awesome and the screen is Titanic sized. Its free at wmdeals.com under current promos. TMO has had a lot of firsts but then they get left behind with high end devices … Nokia didn’t do them any favors with the 710 especially with news of the 900 and 800 being elsewhere. The 800 hasn’t been picked up . How weird is that ? i’m not a fan of Nokia phones anyway but still .. TMO could use both. they could use the Nexus, the iPhone, the Titan lol … oh well ..
TMO is only going to use the low-end WP phones to drive customers toward their droids by out-spec’ing. Now all I need to know are the GPS nav apps for Windows Phone and how they compare to Nokia Drive. Granted, both current Windows Phones on Magenta have 8GB of fixed storage which is quite unfortunate. And no, Skydrive doesn’t count as it’s not good for streaming music or installing apps. Navigon and you’ll never need a gps ever again. Turn by turn if you dont want to invest the money (you wont be disappointed if you go with navigon). Walmart in store price $28.88. Does this mean that you’re not going to have to use those telephone entry systems like these any more?